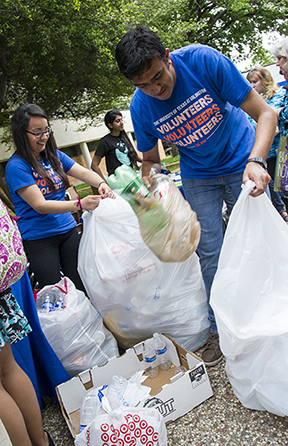 A candlelight vigil and fundraiser are planned to show UT Arlington's support for those affected by the earthquake in Nepal. The vigil is set for 7:30-8:30 p.m. Wednesday, April 29, on the library mall. The Nepalese Student Association will collect donations for disaster relief during the event. "UTA stands united in sympathy with the people of Nepal, India, and Bangladesh in the aftermath of the magnitude 7.8 earthquake that struck central Nepal on Saturday," says Timothy Quinnan, vice president for student affairs. "Our thoughts are with the Nepalese community during this extremely difficult time." The quake affected more than 6.6 million people and caused widespread destruction. The University is assisting those directly impacted by the quake—which includes more than 300 Nepalese students—with communication with family members, expediting travel home, offering counseling and other support services, and fundraising for relief efforts. For additional assistance or questions, contact Satu Birch of the Office of International Education at 817-272-2355. What can pythons, pigeons, and beetles tell us about what it means to be human? More than you might expect, according to a trio of biologists in the College of Science. 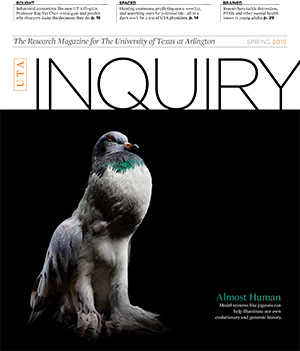 In the latest issue of Inquiry, UT Arlington’s research magazine, you can read about how researchers are using comparative genomics to better understand and explore the genetic mechanisms and evolutionary processes that make humans tick. The spring 2015 issue also discusses new treatments for college-age students with mental illnesses; how UTA physicists are exploring the wonders of the universe from a variety of angles; and why political cartoons are key to free speech and cultural expression across the globe. UT Arlington is an early voting site for the May 9 joint election. The polling site will be open from 8 a.m.-5 p.m. today, Tuesday, April 28-Thursday, April 30, in the Maverick Activities Center. To vote early on campus, you must be registered to vote in Tarrant County and must present an approved photo identification such as a Texas driver license or Texas election identification certificate, Texas concealed handgun license, or U.S. passport. For more information on early voting, see votexas.org and Tarrant County elections. 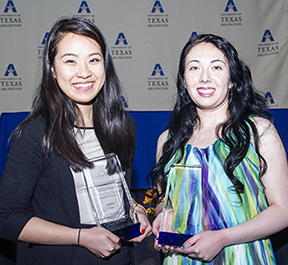 Loan Ho, left, business senior and Student Congress president, and Courtney Brocker, history/philosophy senior, tied for the Wayne Duke Leadership Award at the Leadership Recognition Ceremony last Tuesday. Dr. Duke was a longtime vice president of Student Affairs. Students and members of the Arlington community can receive personal financial advice and credit consultations from 30 volunteer financial service professionals during Money Smart Week, Tuesday-Friday, April 28-May 1. The College of Business and the Student Money Management Center sponsor the event for Financial Literacy Month. Workshops are offered on student loan repayment, setting financial goals, money management, and credit. Volunteers from the FDIC, the Federal Reserve Bank of Dallas, Office of the Comptroller of the Currency at the U.S. Department of the Treasury, and other partners from the Financial Fitness Dallas-Fort Worth Coalition also will offer workshops. Professional loan officers will offer personal credit report evaluations and recommendations for improvement. Attendees will receive a free copy of their credit report. Parking spaces in Lot F6, north of the Maverick Activities Center, will be reserved Tuesday-Thursday, April 28-30, for early voter parking. Parking options include permit spaces in the surrounding lots. Contact Parking and Transportation Services at parking@uta.edu or 817-272-3907. UTA Libraries is launching a new service to help campus organizations use telepresence robots outside the library. Robot Ambassadors—library staff members—will provide training and assistance before a scheduled event, troubleshoot technical issues, and usher the robot to and from the event. Robots may be checked out for three hours at a time. 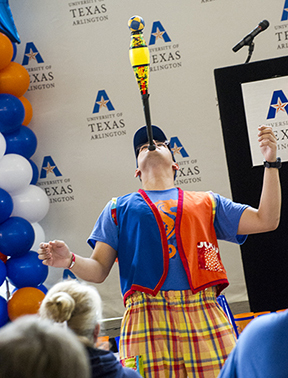 To reserve a robot or find out more, contact the Robot Ambassadors at robots@uta.edu. Learn more about the library's robots. Summit Avenue from Greek Row Drive to Fourth Street will be closed beginning Tuesday, April 28, for approximately three weeks to allow the city of Arlington to upgrade water and sewer lines and resurface the street. Student volunteers round up plastic bottles at last Wednesday's Earth Day celebration on the University Center mall. The bottles were traded by visitors for herb plants. Earth-friendly vendors touted various recycling and green programs. Javier Giribet-Vargas entertained faculty and staff members at the Nedderman Society cookout Friday. The broadcast junior juggles to pay for college expenses. Several job openings on campus for 2015-16 are listed on SnapJobs. The University Housing office needs a graphic design intern. Apply online for ID 8149 by 5 p.m. Friday, May 1. For more details and to apply, go to UTA's Snap Jobs site. In an often overlooked corner of the UT Arlington campus lies a graveyard. Its flat stones are all that remain of a 67-acre complex known as the Berachah Industrial Home for the Redemption of Erring Girls. Now, UT Arlington Libraries is highlighting this piece of local history with an online pilot project of 18 digital images. The Berachah Home was established in 1903 by the Rev. J.T. Upchurch and his wife, Maggie Mae, as a place for homeless, usually pregnant, young women. The Upchurches strongly believed that mother and child should not be separated, so they helped the women learn to care for their children and taught them a trade so they could support their families. One of those trades was printing. 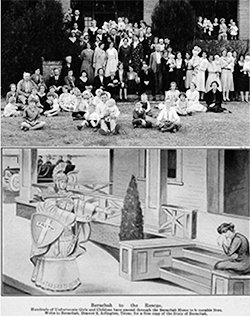 The Berachah Home had its own printing facility and printed the Purity Journal, a periodical that campaigned against brothels and saloons, but also shared stories of redemption and salvation. Three Purity Journal covers are included in the online collection. The Berachah home closed in 1942, and the land was sold to Arlington State College (now UTA) in 1963. UTA Libraries Special Collections acquired the Berachah Home materials in 1982 and 1984. The digital collection is the first in what UTA Libraries hopes will be many more digital projects supported by Omeka, a content management and Web publishing tool. See the Berachah Home digital exhibit. For information about the home or the project, contact Special Collections at spcoref@uta.edu or 817-272-3393. Baseball Mavericks vs. Arkansas-Little Rock. Tickets $5-7; $3 students. 6:30 p.m. Also, 2 p.m. Saturday, May 2; 1 p.m. Sunday, May 3. All at Clay Gould Ballpark. Athletics. Softball Mavericks vs. Texas State. Tickets $5-7; $3 students. 1 and 3 p.m. Also, noon Sunday, May 3. All at Allan Saxe Field. Athletics. BFA Art Exhibit The work of 43 Bachelor of Fine Arts candidates includes painting, drawing, sculpture, glass, printmaking, film/video, photography, digital imaging, and visual communication. Hours 10 a.m.-5 p.m. Mondays-Fridays, noon-5 p.m. Saturdays. Through Saturday, May 16. The Gallery at UTA. UTARI Seminar Kevin Schug, right, the Shimadzu Distinguished Professor of Analytical Chemistry and Shimadzu Science Advisor to the Vice President for Research, presents “New Vacuum Ultraviolet Spectroscopy Detector for Analysis of Volatile and Semivolatile Organic Compounds.” RSVP to ride shuttle. Lunch included. Free. 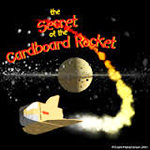 Noon-1 p.m., boardroom, UTARI, 7300 Jack Newell Blvd. S. UT Arlington Research Institute. Biology Colloquium David Pollock of the University of Colorado Denver, "Molecular Convergence, Adaptation, and Coevolution." Free. 4-5 p.m., Room 124, Life Science Building. Biology. Materials Science and Engineering Seminar Anton Malko of UT Dallas presents "Quantum Phenomena to Applications in Energy Sustainability." 11 a.m.-12:30 p.m., Room 104, Engineering Research Building. Materials Science and Engineering. Flying with SOFIA M.H. Tykoski, an eighth-grade science teacher in Wylie, tells about her flight on the SOFIA, the Stratospheric Observatory For Infrared Astronomy. 5:30 p.m. reception, 6 p.m. lecture, Planetarium. Planetarium. Here's the pitch: Pitchers, from left, Chad Nack, Brad Vassar, and Joel Kuhnel gave strong performances in the weekend series against Louisiana-Lafayette. The Mavericks scored only three runs in dropping all three games of a weekend series at Louisiana-Lafayette. UTA received strong pitching performances from Chad Nack, Brad Vassar, and Joel Kuhnel but lost 5-0 in Game 1, 3-2 in Game 2, and 4-1 in the finale. The Mavericks are 17-25 overall and 8-13 in the Sun Belt Conference. They visit Houston Baptist today Tuesday, April 28, before hosting Arkansas-Little Rock for three games Friday-Sunday, May 1-3, at Clay Gould Ballpark. The softball team lost a doubleheader 5-3 and 9-4 to Troy on Sunday in Troy, Ala. Saturday’s game was canceled due to inclement weather. The Mavericks left 15 runners on base in the two games. Senior Nina Villanueva extended her streak of reaching base safely to 23 games with a hit in each contest. UTA is 27-24 overall and 8-12 in the Sun Belt Conference. The team returns to action this weekend when it welcomes Texas State for a three-game series beginning Saturday, May 2, at Allan Saxe Field. Senior Day is scheduled for noon Sunday, May 3. The women’s and men’s track and field teams wrapped up the outdoor regular season with strong performances Saturday at the Bobcat Classic in San Marcos. Sophomore Tamerah Gorham finished first in the 800 meters while teammate Latricia Brooks was second. In men’s action, junior Roland Sales won the high jump. The Mavericks compete in the 2015 Sun Belt Conference Outdoor Track and Field Championships beginning Friday, May 8, in Gulf Shores, Ala.
A late surge vaulted UTA to a runner-up finish at the Sun Belt Men's Golf Championship last Tuesday in Miramar Beach, Fla. The Mavericks began the final round tied for fourth and dropped several spots before a nice run on the back 9 moved them up the leaderboard. UTA shot a 1-over-par 285—the second best round of the day—to complete a plus-13 865. Freshman Aaron Guanlao paced the Mavericks with an eighth-place individual finish.